Stars rang in the new year at the 29th annual festival's award show and benefit. With less than two weeks before Oscar nominations close January 12, it’s also one of the season’s biggest moments for contenders to strut their stuff. 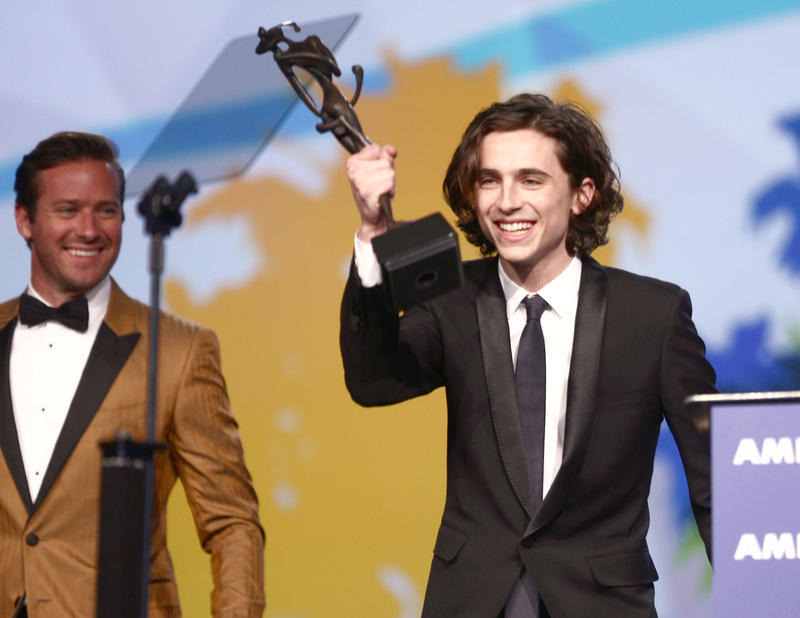 While there’s no questioning the merit of those honored at the PSFF’s annual Film Awards Gala — including Saoirse Ronan (“Lady Bird”), Timothée Chalamet (“Call Me by Your Name”), Oldman (“Darkest Hour”), Holly Hunter (“The Big Sick”), Mary J. Blige (“Mudbound”), and the creative team behind “The Shape of Water” — awards-season strategists view the event more as a stepping stone than a destination. As one said, it’s a campaign opportunity. Within the projected 130,000 PSIFF attendees, the real power lies in an estimated 30 to 60 Academy voters. Festival chairman Harold Matzner touted that 48 of the festival’s 53 honorees over the past five years went on to earn Oscar nominations. Palm Springs’ awards are just one stop of many this week, which also includes the New York Film Critics Gala Awards dinner and the Golden Globes. In the relentless campaigning of an Oscar contender, however, Palm Springs offers something of a respite with its “black tie-optional” dress code. (This left presenter Aaron Sorkin griping: “Every day is black tie-optional.”) However, Ronan told red-carpet reporters that she appreciated the winners being announced in advance, granting her a brief reprieve from competition. PSIFF opens with “The Post” and will also screen films like “Phantom Thread,” “Three Billboards Outside Ebbing, Missouri,” and “The Disaster Artist,” but it possesses the most clout for its foreign-language offerings. The festival will screen works from more than 77 countries, and host a panel with the directors of the nine Best Foreign Language Films on the 2018 Oscar shortlist. After passing through metal detectors, convention center guests — mostly older and white — walked along a second, indoor red carpet that passed a parked silver Cadillac (an event sponsor), an expansive bar, and vases that pulsated with changing neon hues. Rimmed with pastel blue and green chairs, each dining table contained a plethora of objects: tiny, glowing Buddha-figurines in place of candles; chocolate “movie theater film reels;” centerpieces inlaid with glass pebble tiles, plastic seahorses, and some 16,000 white orchids flown in from Holland. Distracting somewhat from speeches by Patty Jenkins (“[Gal Gadot] made me believe that some of the greatest work can and might be done in tentpole movies”) and Chastain (“What a difficult year 2017 has been for all of us. Major change is coming, and change is good, change is needed”) was the robust security presence, which included 350 members of the Palm Springs Police Department and six armored vehicles surrounding the building. Read the full list of winners below. PSIFF runs through Monday, January 15.